Purdue Researchers have developed a technology which could provide an “instantly rechargeable” technique that is safe, inexpensive and environmentally friendly for recharging hybrid and electric vehicle batteries via a quick and easy process akin to refueling a car at a gas station. The breakthrough could accelerate the acceptance of hybrid and electric vehicles by eliminating the time required to halt and re-charge a conventional electric car’s battery and greatly minimizing the need for new infrastructure to support re-charging stations. John Cushman, Purdue University distinguished Professor of Earth, Atmospheric and Planetary Science and a Professor of Mathematics, presented the research “Redox reactions in immiscible-fluids in porous media – membraneless battery applications” at the latest International Society for Porous Media 9th International Conference in Rotterdam, Netherlands. Cushman co-founded Ifbattery LLC (IF-battery) to additionally develop and market the technology. Electric and hybrid vehicle sales are growing worldwide and the popularity of companies like Tesla is incredible, but there continues to be strong challenges for industry and consumers of electric or hybrid cars. The biggest challenge for industry is to extend the life of a battery’s charge and the infrastructure needed to actually charge the vehicle. The greatest hurdle for drivers is the time commitment to keeping their cars fully charged. Present electric cars require convenient locations to be built for charging ports. The spent battery electrolyte or fluids could be collected and transported to a solar farm, hydroelectric plant, wind turbine installation, or for re-charging. Instead of refining petroleum, the refiners would reprocess spent electrolytes and instead of dispensing gas, the fueling stations would dispense a water and ethanol or methanol solution as fluid electrolytes to power vehicles. Users would be able to drop off the spent electrolytes at gas stations, which would then be sent in bulk to solar farms, wind turbine installations or hydroelectric plants for reconstitution or re-charging into the viable electrolyte and reused many times. It is believed that our technology could be nearly ‘drop-in’ ready for most of the underground piping system, rail and truck delivery system, gas stations and refineries. 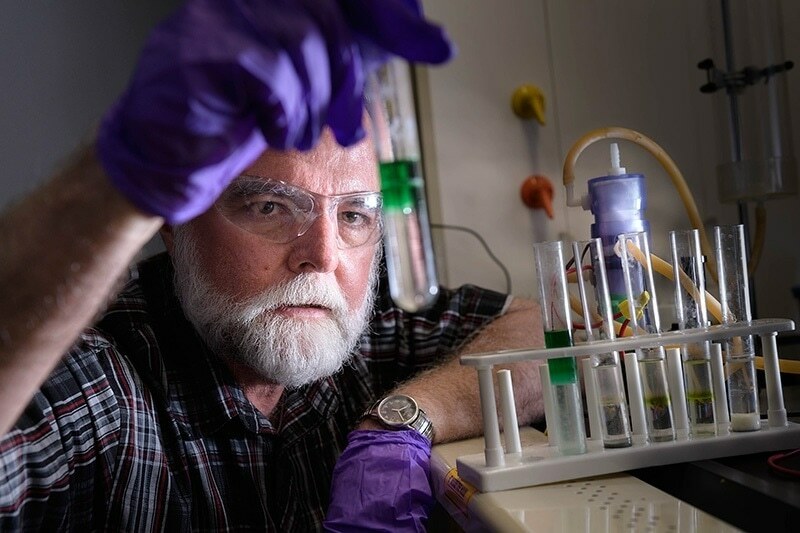 Mike Mueterthies, Purdue Doctoral Teaching and Research Assistant in Physics and the third Co-founder of Ifbattery, said the flow battery system transforms the Ifbattery system into a unique one. Ifbattery’s membrane-free battery exhibits other advantages as well. Ifbattery is licensed as part of the technology via the Purdue Research Foundation Office of Technology Commercialization and has developed patents of its own. The company is a member of the Purdue Startup Class of 2017. We are at a stage in the company’s growth that we are looking for additional financing to build large-scale prototypes and subsequently manufacturing partners.